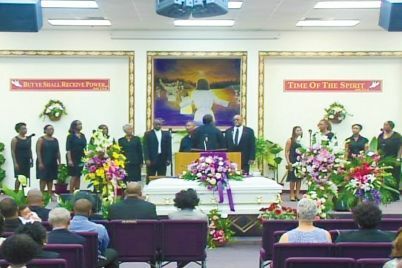 ST. PETERSBURG — Dressed in a mustard-colored shirt, stylish tie and a round, spiffy hat, Badr El-Amin stood next to Stanley Wright at the store mirror as they both admired the smart, summer hat Wright was sporting. 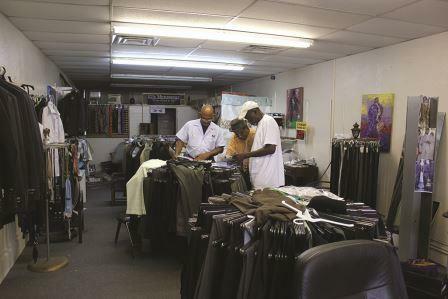 El-Amin, the owner of El’s Menswear, voiced his approval of how well the hat looked on customer Wright. “Look at that!” he said, breaking the quiet in the small shop on Central Avenue. Wright grinned as he looked at his reflection, first turning his head right then left. His smile said he liked what he saw. After having spent some time with Wright perusing a catalog for shirts to order, El-Amin wasn’t done. He is always willing to suggest that something extra to round out an outfit. Among the rock and roll boutiques, hipster beer joints and gritty band venues, El’s Menswear at 672 Central Ave. stands out like a silk black tie coupled with a studded leather jacket. Ducking out of the noisy street and into his quiet store is in a way like stepping through a portal into a time where men never left the house without a fedora. Before stadium-sized department stores, mega malls and about a gazillion online shopping sites, men bought their fine apparel at shops like El-Amin’s. Racks of fine suits and shirts along with displays of ties, hats and even shoes stand out in a colorful array. There is even a shoeshine box positioned by the wall ready for use, as El-Amin himself handles the shine duties. And El-Amin is no stranger to fine men’s apparel. He worked for 21 years at the legendary Arnold’s Men’s Wear, which was run by Arnold Argintar and a fixture on Central Avenue from 1935 until it closed its doors more than 70 years later. As a young, business-savvy man, El-Amin actually began to move Arnold’s merchandise even before he officially worked for there. Where others may have seen simply piles of outdated duds, El-Amin saw potential. He viewed all this booty as an untapped treasure and made the decision to cash in on the opportunity. “Arnold, what do you want for those hats,” he asked. “I’ll sell them to you for four dollars,” Arnold replied. Now his idea had developed into a plan, and after buying about $20 dollars’ worth of big apple hats at wholesale, he decided to hit the streets directly to hawk them to passersby. A born salesman, he sold every single one. Then it was back to Arnold’s to secure fresh inventory. After getting the same result with the shirts, next came the Nehru suits and the peg-leg pants. Though Arnold had initially purchased these clothes and hats while they were in vogue and had sold them at a decent price back then, there was no place for the stock that remained by the mid-1980s. But the key, according to El-Amin, was that the clothing was still brand new and he could still sell it. “It didn’t matter how old they were, as long as they were brand new,” he maintained, slapping his hands together for emphasis. He estimates he spent about $5,000 purchasing Arnold’s unsold stock and made a thousand or two in profit by moving it on street corners with his charismatic salesmanship. Arnold’s wasn’t the only place El-Amin frequented in hopes of replenishing his sidewalk stock. One day, he had parked his car in front of Arnold’s during a downtown trip to Maas Brothers, on one such mission to find fresh stock to resell. When he returned to his car he found a note on his windshield. It was from Arnold, and it instructed El-Amin to come inside the store. Arnold wanted to talk to him. El-Amin opened the door to see Arnold and his wife waiting for him. “Yeah, I’ve got a part-time job,” El-Amin lied. In actuality, he already had a full-time job at the Suncoast Manor nursing home, in the shipping and handling department. Arnold then told him that he needed someone new to work in the store since an employee he’d had walked out. “I came to work, and he told me what he expected of me and told me, ‘If you stay with me, I’ll make it worth your while,’” El-Amin said, adding that he was even given suits and ties to wear while working at the store—another perk. Now it was time to return to his regular job at the Suncoast Manor, but El-Amin honestly didn’t know which path to take. Arnold had no benefits while at Suncoast he could retire with benefits being part of the package. Yet there was something about Arnold’s that pulled him. It turned out that the decision was ultimately made for him. But he already knew a place where there was a job waiting for him. And he held his post at Arnold’s over the next two decades. 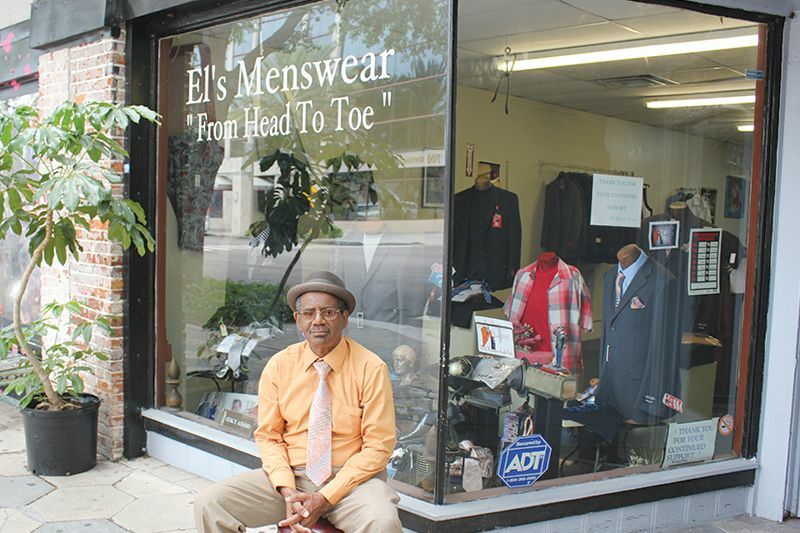 In 2007, when the venerable shop finally closed its doors, El-Amin purchased the remaining stock of men’s clothes from Arnold while Arnold’s daughter got the postal uniforms. 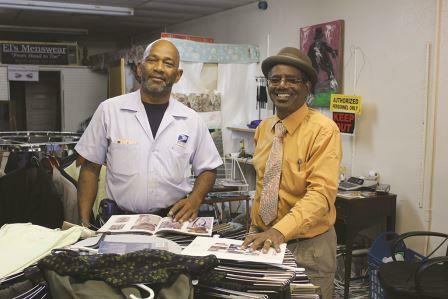 The postal workers receive about a $400 allotment, El-Amin explained, to spend on uniforms and shoes, and it had been a profitable business in itself for Arnold’s store over the years. They opened El’s Menswear just down the street on Central, going into it as partners. But after about a year, Arnold’s daughter decided to pull out altogether and sell the uniforms in her own shop. Consequently, El-Amin now had the space to himself to carry the torch by selling men’s fine apparel. At his current location for eight years now, El-Amin still serves some of the clientele that was faithful to Arnold’s. Many of Arnold’s customers were African American, El-Amin explained, as Arnold extended credit when many other stores refused. The customers at El’s Menswear range from young men in their 30s to old-timers, including a 92 year old who still shops there regularly. El-Amin believes he has been earning the trust of the people all these years, and strives to continue to do so. More than a few of his customers can attest to this. 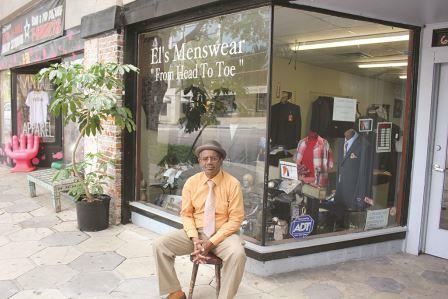 Robert Mobley, who remembers being taken to clothing stores around St. Pete as a young man by his father, was a steady customer at Arnold’s and now continues to buy his dress clothes at El’s. Mobley said he likes the personal service he gets at the store, where he visits about twice a month, or more if there is an event that calls for a special outfit. El-Amin claims that people these days still seek the personal touch. 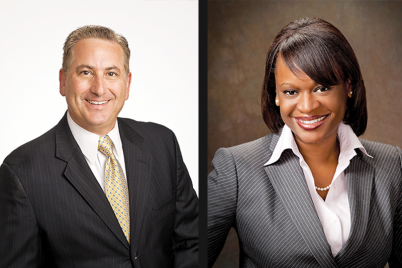 “It’s more than selling,” he affirmed. He often sits outside his shop and engages passersby in his effortless way as they walk by the stores on Central. Even these impromptu sidewalk chats come back to El-Amin in a small cosmic way. “Once a homeless man came into the store and said, ‘Remember you were talking to me out there? You talked to me nicely out there. Well I want to bless you. I need a black suit,’” El-Amin recalled. El-Amin had told the man that he didn’t have a black suit but had a nice blue suit that he could try on. The man put it on and it fit him perfectly. The man promptly handed El-Amin the money. It turned out that a woman had given this down-on-his-luck man $3,000 to help him out, and this man decided to pass on some of his good fortune to the shop owner who had been so kind and friendly to him. El-Amin mans his men’s store daily; open to close, except when the shop closes on Sundays. He never takes time off for himself and even illness doesn’t stop him from showing up on time in the morning to open the store. He maintains that the interest he has is “bigger than just selling.” He likes to see people come back. Wright continued modeling the hat in front of the shop mirror as El-Amin looked on. After a few more approving glances in the mirror, Wright finally removed the hat and lets El-Amin know he’d probably be back for it. “He gets me every time!” Wright said, chuckling and shaking his head on his way out of the shop.